SilencersOnline.com was founded by industry experts to serve as a SIMPLE and AFFORDABLE way for fellow gun enthusiasts and sportsmen to acquire silencers. Our aim is to eliminate all of the myths and misconceptions surrounding silencer ownership and provide the public with the information, product access and rock bottom pricing on silencers from all of the industry’s top manufacturers. We started as a retail firearms store, EBS Arms, located in Downtown Cape Coral, FL. 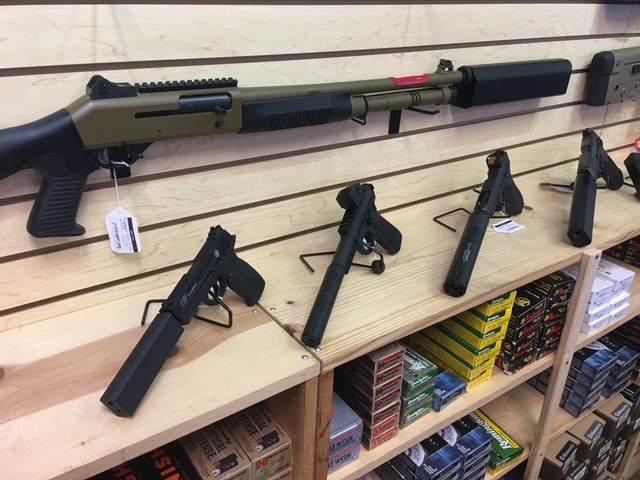 We quickly realized that the silencer market in Southwest Florida was grossly under-served, so early on we became a Class 3 dealer and added a selection of Title II firearms (silencers, short barrel rifles, AOW, Machine Guns, etc) to our retail store selection. Within a short period of time, we became one of Florida’s biggest Class 3 dealers with hundreds of silencers in stock. After we were able to catch up with the local demand for silencers and other Title II firearms, we set our sites nationwide. We believe that the national silencer market is very much under penetrated and we see an opportunity to educate the public and bring silencer ownership as mainstream as firearm ownership. At SilencersOnline.com, we are sportsmen and enthusiasts just like you. We very much look forward to helping you get into silencers and welcome the opportunity to speak with you over the phone, via email or even in our retail store in Cape Coral, FL.